There's a totally cool graphic designer (and foodie! see her blog) based out of Vancouver that I think you'll really dig. 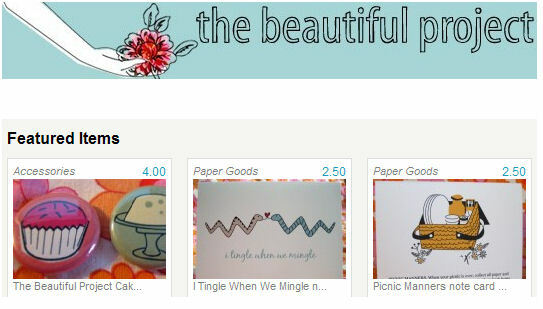 I'm not sure what her name is, but her Etsy shop is called The Beautiful Project and like most of us, this creative girl is inspired by girlish pretty things - vintage notions, children's books, textiles... I love the card with the two cutie snakes on it, "I tingle when we mingle". I liked her food blog bio: "This is the blog of a 30-something, food-obsessed designer living in Vancouver, BC. She writes, draws, cooks and crafts and loves to ride her bicycle around town. She believes that there are a few still undiscovered passions that await. Her fingers are crossed." Tip: She'll combine shipping for multiple purchases and she offers custom work, too.